I live in the center of the town of Pine Bush (aka town of Crawford). I do not need confirmation of my house being haunted. We know for sure that it is. I've lived in this house for over 30 years and our guests made themselves known within the first year with footsteps on the stairs. Throughout the years we've had shadow people, sightings, objects unexplainably thrown across rooms, voices coming from the walls or downstairs or sometimes even upstairs (usually from where-ever you're not). Full body apparitions were seen on numerous occasions. Phone wires were pulled from the phone Jack right after speaking on phone in the same room as the jack. Figures have been seen walking from room to room going downstairs coming from windows and walking through dining room and busy doing chores on the back deck. Photos show orbs, faces, shadow figures, and on one occasion a full apparition formed during daylight. Sometimes seen out in the yard also (house next door was reportedly a funeral parlor in the 50's). Voices range from inaudible conversations to growls, mostly males voices and only this past year a young female age around 8-12 years old. A ghost hunting company recorded voices as well as family members. Only clear name we could understand was ''Dave'' repeated numerous times in one night. But we believe that Dave was a recently departed friend that found his way to our home. We are not listed on any haunted house directories or lists. As I stated we do not need confirmation. We have lived with our guests 30 years and have just grown accustomed to their almost monthly visits. We've tried to find any history on our home, so have a few ghost hunters, no one seems to find anything other than a horse track was in this area in the early 1900s. So that's my story. 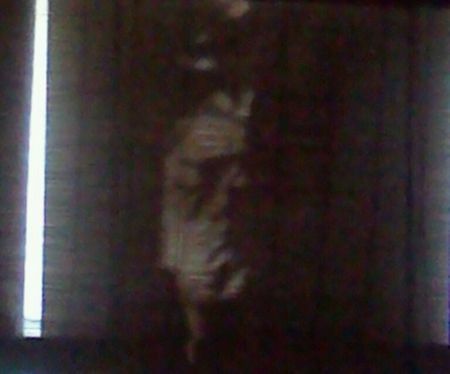 The posted picture with this story was just an eerie face that manifested one day as the sun shone through another window causing shadows to form this. It lasted about 10 minutes. I would say that definitely is a picture of one of your guests. Looks like a male to me. Great proof!. Looks like a murdered gangster. I agree!! Looks like a mobster mug!!!. Definitely looks like a gangster mug from the 40's! !.